Hey, Bif! We have company! Good help can be hard to find, you know. I could straighten up a little. Uh, let's just head outside, shall we? Go on, I'm right behind you. Boyfriend I'm LOVING your wild horse hair!!! 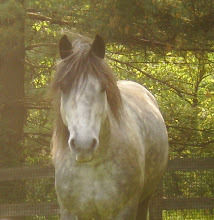 That forelock and mane are to-die-for! Donkeys don't grow hair like you do! Those donkey's are so adorable, it's redonkuless!